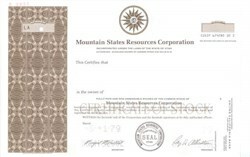 Beautifully engraved SPECIMEN certificate from the Mountain States Resources Corporation. This historic document was printed by the Security-Columbian Banknote Company in 1979 and has an ornate border around it with a vignette of the company logo. This item has the printed signatures of the Company’s President and Secretary. Micro-Media Solutions Inc., a turnkey network integration company, went public in 1998 through a reverse merger with Mountain States Resources Inc. of Utah. The public shell company had no assets or operations, but it did have plenty of stockholders. They acquired all the common stock of MSI, which stamped its name onto Mountain States Resources.